During the last decades, Paraguay has experienced dramatic changes in its land cover/use. Its deforestation rate was one of the highest in the world (FAO, 2010), resulting in a significant reduction of its forest cover, particularly in the Eastern part of the country where only a small fraction of the Atlantic rainforest remains today (Huang et al., 2007; Huang et al., 2009). 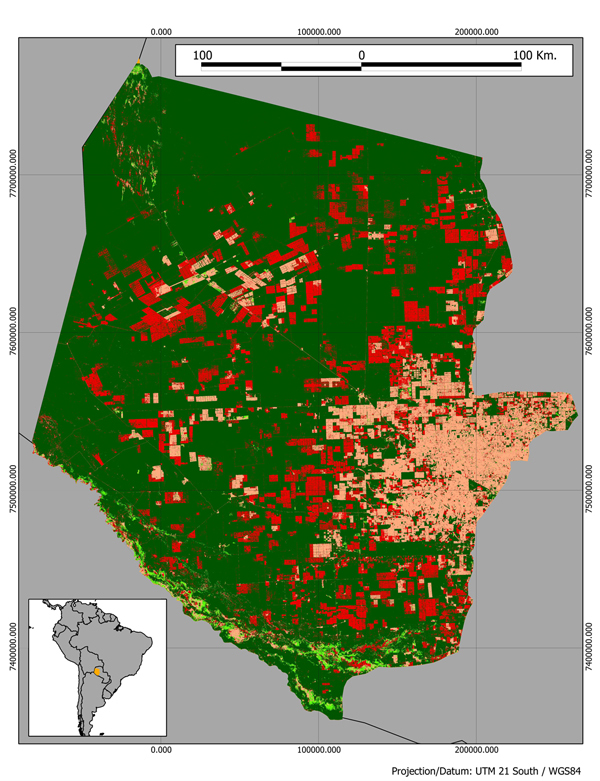 The introduction of the Zero Deforestation Law in 2004, contributed in the reduction of the deforestation rates on the remaining Atlantic forest; however, there are clear indications that a large part of the deforestation activities were apparently moved to the western part of the country (Paraguayan Chaco - Boquerón). Our study analyses a set of multi-year Landsat 7 Reflectance Composites, available through the Google Earth Engine, to provide quantified estimation of the forest cover change between 2000 and 2010, in Boquerón. The Google Earth Engine has been also used in the classification and validation of the results, therefore a first demonstration of its REDD-relevant capabilities is presented. In addition, ALOS AVNIR-2 scenes coming from ESA's TropForest initiative are used to validate the 2010 map (Vollmar et al., 2012). A Support Vector Machine (SVM) was used to create binary forest/non-forest maps for the two periods and the resulted rasters were combined to detect changes in the forest cover. We estimate that approximately 1,300,000 ha of forest have been cleared in Boquerón, between 2000-2010. Using the FAO FRA figures for the same period and for the whole Paraguay, we observe that 68-69% of the deforestation activities of the country during this period, took place in Boqueron. The validation process is currently taking place using the TropForest data and the first results will be presented in the conference. Huang, C.Q., Kim, S., Altstatt, A., Townshend, J.R.G., Davis, P., Song, K., Tucker, C.J., Rodas, O., Yanosky, A., Clay, R., Musinsky, J., 2007. Rapid loss of Paraguay's Atlantic Forest and the status of protected areas - a landsat assessment. Remote Sensing of Environment 106, 460-466. Huang, C.Q., Kim, S., Song, K., Townshend, J.R.G., Davis, P., Altstatt, A., Rodas, O., Yanosky, A., Clay, R., Tucker, C.J., Musinsky, J., 2009. Assessment of Paraguay's Forest cover change using landsat observations. Global and Planetary Change 67, 1-12. Vollmar, M., Simonetti, D., Rasi, R., Achard, F., Paganini, M., Kalogirou, V., 2012. Substituting Landsat TM/ETM+ data with ALOS AVNIR-2 imagery for forest cover change assessment in the Tropics. Sentinel-2 Preparatory Symposium, 23-27 April, Frascati, Italy. The deforestation map of Boquerón. Deforested areas are depicted in red and remaining forest in green. Light pink areas are areas that were not changed during the study period and light green areas are regenerated forest.